It’s been cold and snowy in Britain recently (although today and during the weekend, we’re going to have about +5°C, so nice and relatively warm), of course, being from Sweden, I’ve had a lot of “but of course, you’re used to much worse!” comments. Which is true. -17°C certainly won’t break any cold records even in the part where I’m from (which is around Gothenburg on the west coast, so definitely not “oop North”). 15°C – It does not get hotter than this in Finland, so we begin here; the Spaniards put on caps, winter jackets and gloves. The Finns sunbathe. 10°C – French try in vain to start the central heating in their houses. The Finns plant flowers in their gardens. 5°C – Italian cars will not start. The Finns are cruising in their convertibles. 0°C – Distilled water freezes. The water in Vantaa River gets a bit thicker. -5°C – People in California almost freeze to death. The Finns grill the final sausage before winter. -10°C – Brits start up the heating in their homes. The Finns put a sweater on. -20°C – Aussies flee from Mallorca. Finnish Midsummer celebrations stop, autumn has arrived. -30°C – People in Greece die from the cold and disappear from the face of the earth. The Finns start drying their laundry indoors. -40°C – Paris cracks and crumbles in the cold. The Finns queue at the hot dog stand. -50°C – Polar bears start evacuating the North Pole. The Finnish Army postpone their winter survival training until it gets properly cold. -60°C – Korvatunturi freezes. 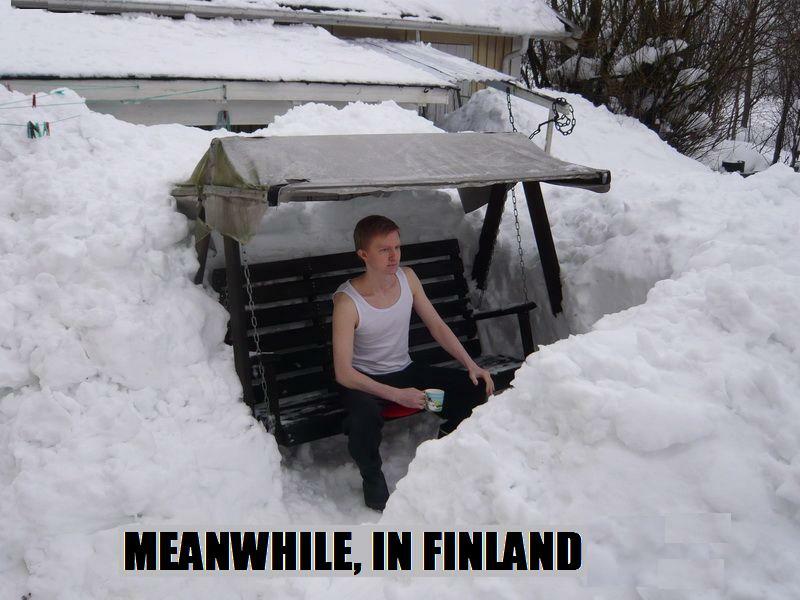 The Finns rent a movie and stay indoors. -70°C – The fake Santa moves south. The Finns get frustrated because you can’t store Kossu (Koskenkorva) outdoors. The Finnish Army goes out on winter survival training. -183°C – Microbes in food do not survive. The Finnish cows complain that the farmers’ hands are cold. -300°C – Hell freezes over. Finland wins the Eurovision Song Contest. 4 Responses to "With regards to the recent cold snap …"
Best wishes from Finland. Thanks for nice words! Today there was only -25 C, I walked 5 kms in perfect weather 🙂 I live very near Sweden, only 2 kms to the boarder. I read somewhere that Russians tend to joke like this about Finland much the same way as Swedes joke about Norwegians. It will be almost C-30 tonight where I am in central Canada. That’s pretty cold for December. It will get as cold as C-40 for sure several times this winter. We don’t even give up barbequing — we just move it into the garage. The garage also becomes a huge freezer. Last year it got very cold for several days at a time so our school had indoor recess. Finally it warmed up a bit to C-26 so we sent the kids outside to play. Then we heard on the radio that Toronto (in southern Ontario, Canada) had cancelled their recesses because it was C-26! That really made us laugh! @Eija: Terve! 🙂 -25 sounds quite cold, but if you’re close to the Swedish border, that would mean you’re very far north! As long as it’s nice weather and you’re dressed nice and warm, there’s nothing wrong with being out in -25 and having a great time … I’d just prefer sitting under a blanket in front of an open fire drinking hot chocolate. 🙂 Maybe living in the UK has made me gone all soft! phylly3: I think that’s the thing; it’s not just “oh look it’s winter and it’s cold” it’s just that it’s colder than it would normally be this time of year. -10 in winter isn’t much of a surprise, but in the UK in the end of November … yeah, that’s a bit weird. If you barbecue in the garage in the winter, maybe I should change the list to be Finns/Canadians! 😉 And “warming up to -26” … how odd that sounds!